Thirteen authors redefine the world’s greatest detective in this short story anthology. Sherlock Holmes has never been far from popular imagination. His evolution from being Arthur Conan Doyle’s most clever creation to becoming synonymous with Benedict Cumberbatch is testament to his, and his creator’s, everlasting impact. What makes Holmes, and by extension, the cast of Doyle’s series, so enduring is the rounded ways they are written — intelligent, witty, stubborn, loyal and compelling. Whether your introduction to Sherlock Holmes was through the original books, or the many adaptations across the spectrum of media, there is no doubt that he has acted as the template for most of today’s TV detectives and inspired many more real ones. It is probably safe to say we have all, in some way or other, re-imagined this iconic figure in our daily lives. Baker Street Irregulars: The Game is Afoot is the second edition of the Baker Street Irregulars anthology series, which was published in March 2017. The sequel, out in April this year, expands the idea of who Sherlock is and what all he could be. The authors in this book range from veteran storytellers to newcomers. Sherlock Holmes, Doctor John Watson, Inspector Lestrade and the sinister James Moriarty are all featured in a variety of renditions, transported around the globe and through time. I received a copy of the title from Netgalley and, as is the case for most anthologies, some of the stories are spectacular, while others are overshadowed by their predecessors. Here, I take a brief look at each story and rank them for originality and Sherlockian dedication. Watch out… the game is now afoot. When the final problem is whether he'll have sugar with that. The opening salvo of the anthology sees Sherlock Holmes and John Watson as co-owners of a barista in Australia. Holmes uses his skills to predict coffee orders, while Watson is the bemused coffee-maker. When a regular patron goes missing, they track down her whereabouts and end up saving the day and an age-old mystery. I was surprised to see this as the opening story because it reads as straight up fanfiction (which, admittedly, is the whole point of this anthology). Combined with uninspiring writing and overzealous reverence, the end result is more laughable than intriguing. One could argue that it suffers because of its placement, since the reader has to adjust and adapt to what they’re getting into, but I’m not letting it off that easy. Sherlock is Santa Claus, Watson is an elf, and a reindeer is dead. Oh, whatever will become of Christmas now!? This is the final story of the anthology and to say it is anticlimactic is giving it too much credit. I know the title gives it away, but this was awful. There is no plot, and the affected speech patterns are aggravating rather than cute. I disliked the fan-fiction vibe of the first story, but this last one is just a slap in the face of any Sherlock fan (many of whom don’t celebrate Christmas, just an FYI, dear editors). After so many lows and too few highs, for the reader to end the book with a fat-shaming, skinny Santa pretend-playing detective is adding insult to injury. Sherlock is a Rabbi in Poland and must rescue some incriminating evidence to help his mentor save his family’s reputation. Atmospheric and stylised, the story is chock-a-block with terms unfamiliar to those not of the faith. I like the concept, but there was no story. The plot is flimsy at best, especially given modern standards. It is evidently an homage to "A Scandal in Bohemia," which is fine, but that was a perfectly shaped 3-act story. Here, the main investigation ends in a lacklustre fashion, feeling more like a cop-out rather than a well thought out narrative. It’s evident the author didn’t have an ending in mind when they started it, which makes this entry an underwhelming read. Watson turns the corner and steps in some manure. Then Sherlock starts talking about panels. They catch the criminal and while they’re talking to each other Sherlock reveals a troubling secret — they’re in a comic book and Arthur Conan Doyle is a pathetic writer. Is my disdain showing? I suppose the idea of breaking the fourth wall will always be appealing, irrespective of who the character is. But, unlike Deadpool, Strauss’ Sherlock doesn’t take the mickey out of the reader or writer for his predicament. There’s an overbearing seriousness to this story, which never eases. In the end, nothing significant happens. The concept is a novel one, yet the execution is meandering and uninspiring. I felt, while reading it, that the writer was far too besotted with the idea of the story rather than the writing of it. Was it supposed to be irony, satire, or tongue-in-cheek reverence? Well, it did not come across as any of those. Instead, this was little more than a thinly veiled attempt at belittling Doyle’s skills, while never trying to elevate the story to anything greater. Lock is a Black graduate student whose trusty android computer is constantly trying to outsmart him — to no avail. When a fellow student, afraid for her life and the safety of her dissertation turns up, Lock becomes embroiled in a case involving genetic splicing and venomous snakes. Conceptually smart, the story is undone by hackneyed editing and a pretty lame premise. Who is to blame, I do not know. Through exposition we are told that this girl is flirting with Lock, but there is little in the text to suggest the same. It surprised me that the author, also a woman, would whittle down her sole female character’s dress sense and poise to attracting a man. Also, the android stand-in for Watson is obsessed with the idea of matchmaking Lock with any woman that walks by him. It’s the kind of frat-boy attitude that may have worked in a character-driven story, but this one doesn’t work hard enough on building character. I wanted to like this one, but it was frustrating to read the author’s characterisations rather than surmise them ourselves. Ship captain She’er is waylaid by the sudden reappearance of their former spouse, Chief Wa’ats of the IEA. Wa’ats is convinced their archenemy Mori, of the scary all-female Amrighans has escaped imprisonment and is aboard She’er’s ship. Can they find her before she tears the ship and their relationship apart? Set in a genderfluid future, the author allows herself to be confined by the gendered notions of today’s age, including her avoidance of the singular ‘they’ pronoun. I found it annoying that the protagonist’s life is squandered by their decision to have a family. Also, every time the reader becomes invested in the investigation, we are hindered by the two protagonists discussing their private life. We get it, you don’t agree on the family issue, but you are toxic, so split up already. The pacing and plot were too uneven and the focus is continuously on the wrong aspects of the characterisation. In addition, what should have been an uncanny plot twist was diluted for the sake of a safe ending. Jack Watson, a med student and Shirley Holmes, a young know-it-all, get on the case of a serial burglary, but is there more to the stolen items than meets the eye? DeCandido has written a lot of fiction, non-fiction, tie-ins, etc., and his many influences are prevalent in this story. He mixes things up by diversifying genders and races, and more importantly, throws in a shade of what it’s like not being a White male in the US. As stories go, this is as close to Doyle without being an outright copy, with enough of an upgrade to make it relevant. The only problem is the language. This being a galley copy, I’m expecting the final product to be more polished than what I read. I am sure the errors will be erased, but the quality of writing… I am not sure if there can be any changes. "Six Red Dragons" suffers for its lacklustre writing and colloquialisms, which ruins the flavour of the story. Sherlock and Watson are both teachers at the same school. Dedicated to their work, Sherlock occasionally dapples in solving minor cases for the school — for example, little Billy’s lost green crayon. But, the stakes are raised when a dead body is found on school grounds. Can Sherlock find the killer in time? This is one of the first stories in this anthology that directly recognises Sherlock’s skill at disguising himself. McPherson elevates the status of educators in her story, respecting their hard work and importance in mentoring the next generation. There are a few twists and turns, which make the story a page turner. I would say this gets off to a rocky start, and despite its red herring title is definitely a good interpretation of Doyle’s work. Jonathan Maberry’s introduction to the second edition is full of raw reverence for a character that has so obviously played an integral role in his life. The anecdotes he includes of using Holmes’ inductive reasoning ring true of many a youngster emulating their idols to be the hero in a usually mundane real-life story. It is perhaps unorthodox to add the introduction in the ranking of short stories, but this is the kind of Sherlock story one of the Baker Street Irregulars from Doyle’s series would probably be telling us today. They may very well have grown up in similar surroundings to Maberry, with a troubled family and a lack of role models. The passion for the character and Maberry’s decoding of what makes him appealing to the reader made this a memorable read. Watson and Chief Lestrade find a dead body in a space pod — it’s an obvious homicide, but how did the murder occur inside a locked pod? Precocious teenager Sherlock seems to have an idea, but Watson’s going to have to rescue him if he’s ever going to close this case. I wasn’t sure about this one because Sherlock was just too arrogant and rude. I’m not a fan of such characterisations, and it grated on me as I read it. But, there’s a fabulous twist in the end (which you may or may not see coming) that almost redeems the many flaws in the author’s writing. Almost. There are several instances of lazy writing — perhaps the author believed his repetitive phrasing could be construed as refrains. Unfortunately, they just paused the elegantly constructed world and pacey story. Beebe has some of the crispest action writing of the anthology and a distinctive view of the world of Sherlock. Set in post-Civil War America, a rural town is shaken by the apparent suicide of a young, beloved girl. When the town sin-eater claims the girl’s death was by the hands of another, an investigation begins. But who in this small town would commit this crime? Or, is it someone completely unexpected? This story is a perfect reimagining of Holmesian stories. Were it not for the obvious references, Linzner could very well be writing an original work. This story features quality writing that places the reader squarely in the world of the writer. The setting is so vivid, as are the people and their circumstances. Little touches here and there round out characters that would have otherwise been two-dimensional in a lesser work. Despite the occasional slip in language and the clumsy efforts to hide the gender of the protagonist, you can easily lose yourself in this story. Sure-Lock and What’s-On? are highly customised home technology systems. Sure-Lock is the paranoid home security system, while What’s-On? takes care of their owner’s social calendar. Exceedingly protective of their owner, their hackles are raised when she brings home a stranger. Now, they have to outwit their programming to save their maker and the day. Jody Lynn Nye was also featured in the previous Baker Street Irregulars, and this story is a welcome return. Despite the cyber-punk riff, she captures the ethos of Doyle’s writing, but aptly infuses it with a brand-new energy. The writing is crisp and gripping — the kind of heist story that is visually arresting. I can see this as a Black Mirror episode. Nye uses the varying definition of space for a computer brain deftly and vividly. This is the kind of translation that would make Doyle sit back and marvel at how far Sherlock has come. One of the best instalments in the book. In ancient Egypt, the Pharaoh has just died. Before the coronation of the new Pharaoh, Raneb meets with Royal Librarian Seshet in a last-minute effort to save his home. New land deeds suggest that a significant part of the Black Land, worshippers of Horus, will be given to the Temple of Set. For fear of his home being bankrupted and his people enslaved, Raneb appeals to Seshet to find any loopholes to save his people and understand the old Pharaoh’s plans. This was such an incredible entry. Stegall captures the essence of old Egypt, its politics and atmosphere, while also imbuing the story with Doyle-ian twists and wit. I don’t know how accurate any of the Egyptian stuff is, but I’m hoping there was some research put into writing this story, because it was well worth the read. I think this story deserved to be further in front in the book, rather than ensconced in the middle. Theramin Joule’s world is turned upside-down when he is sent a copy of a 500-year-old magazine with his name and address scribbled in it. This can only mean that the timeline has been contaminated — but by whom, and for what purpose? Joule has to get to the bottom of this mystery, but he fears what he will find. With the help of his close companion Dr. Andwhinge, he sets out on a journey through time that will change his life forever. If this was a 1000-page tome, I would read it. If this was a film, I would be the first person to watch it. Regan has put so much thought into creating this world; it seems a shame to waste it as the penultimate short story in a Sherlock anthology. There is a strong Ready Player One-esque vibe to this world, meaning entertainment has taken precedence over real life. Those who live in the ‘real’ world go to extreme lengths to maintain its integrity. There are the privileged Blues bullying the downtrodden Greens. And then there’s Theramin, mingling with the wrong sort and getting himself into trouble. In such a short span of time, Regan packs in plenty of techno-babble and world-building — some of it does his story a disservice, the rest piques the reader’s interest. Unfortunately, due to its curtailed word count, the ending feels just that little less satisfying. But, this is the kind of story that makes the journey of reading worth it! They say imitation is the sincerest form of flattery. The authors of this anthology series have elevated imitation to art. Each author’s interpretation of this classic character adds a new dimension to what Sherlock Holmes is or can be. 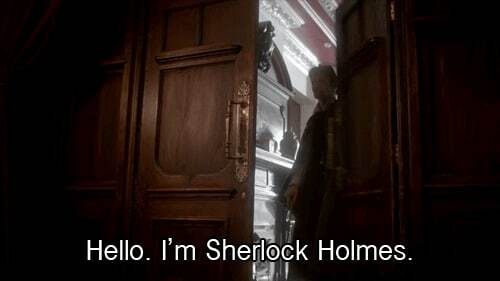 Every time Sherlock is a different gender, of a different race, in a separate profession and living in a different time, the character attracts a new audience and becomes a relevant and new idol to whole new diaspora. Though not consistently engaging and polished, Baker Street Irregulars: The Game is Afoot is the kind of unmissable series every Sherlock fan will enjoy. Baker Street Irregulars: The Game is Afoot will be out in April. Do you agree with our ranking? Let us know which stories you prefer and why. Beyond Apocalypse: Who Will Be The Next X-Men Villain? How Batman V Superman Broke The Internet - Before It Was Even Released!